Gas in the stomach is typically caused by swallowing air while eating and by the breakdown of food in the large intestine. Certain foods such as beans, pears, broccoli, mushrooms, milk, whole grains and apples can contribute to gas. Common gas symptoms include flatulence, burping, bloating and abdominal pain and discomfort. Because gas can be severe and debilitating, it's essential to understand how to get rid of it after eating. Sit up straight after you eat to decrease abdominal pressure and help ease bloating and gas. Walk around after eating. Moving helps with digestion and can reduce the gas and bloating that occurs after mealtime. 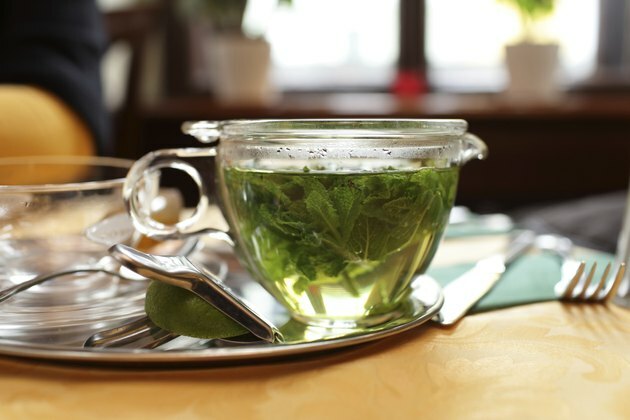 Drink a strong cup of peppermint tea immediately following your meal. Peppermint helps relax the muscles of the digestive system, which allows painful gas to pass easier. Eat a food with probiotics in it such as yogurt, miso soup or kefir. Probiotics are natural bacteria that help to reduce gas. You can also find probiotics in supplement form. Take a digestive enzyme supplement, which helps your body digest and break down food more thoroughly. Pop an over-the-counter medication designed to help reduce gas such as alpha- galactosidase or simethicone. Lactose drops and tablets can also help gas related to lactose intolerance. Prevent future episodes of painful stomach gas by chewing your food thoroughly before you swallow it. Chewing well breaks food down into smaller particles that are easier for your body to digest. See your doctor if gas symptoms worsen or are accompanied by vomiting, weight loss or diarrhea. These could be signs of a more serious medical condition such as irritable bowel syndrome.